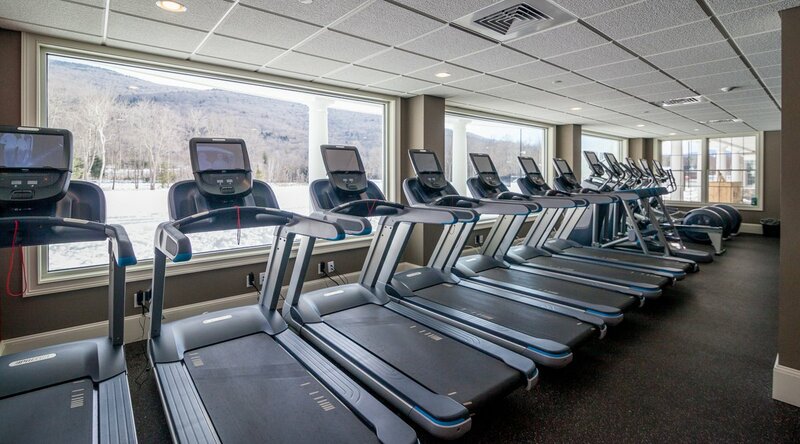 Exercise extraordinary at RiverWalk Resort at Loon Mountain's state of the art fitness facility. This equipment is the best of the best, and will have your heart rate up in no time. Get going, before you get going! Many resorts throw in a "health club" because they need to check the box when listing their amenities. Not RiverWalk. We decided to make our fitness facility a focal point of the resort since so much of the mountain lifestyle is based around good mind, body, spirit, and health. The theme of the fitness center is certainly cross-training. With traditional cardio-vascular equipment such as treadmills and recumbent bikes that complement the effort of the trainee. The free weights and cable-pull machines are above standard quality as are the non-traditional bars, plates, rings, medicine balls, abmats, jump ropes, kettlebells, rowers, etc, etc. The gym is open every day for guest use and is accessed via room key. There are no public members of the club, so you can be assured that you will get the time on the machine that is most important to you. Did we mention the extraordinary view?